Daily Illuminator: Munchkin Adventure Time 2 Hits Stores! May 29, 2015: Munchkin Adventure Time 2 Hits Stores! Did you enjoy Munchkin Adventure Time? Do you want dungeons in your game? 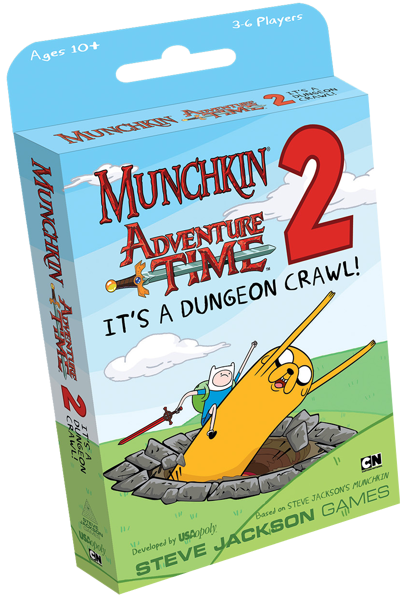 Then you should head on out to your local game store and pick up Munchkin Adventure Time 2 -- It's a Dungeon Crawl! We've just gotten word from USAopoly that it's in stores now, and ready for you to add to your game! 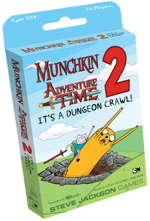 Munchkin Adventure Time 2 -- It's a Dungeon Crawl! Your quest for victory in the Land of Ooo just turned into a dungeon crawl, complete with new monsters, treasures, curses, and special portals. Munchkin Adventure Time 2 -- It's a Dungeon Crawl! adds 90 cards and 12 special oversized Dungeon cards to the original Munchkin Adventure Time. Check out the press release for more information!